A summer party is incomplete without refreshing drinks and chillers. And drinks and chillers of course need to be chilled properly. In case you have an outdoor party, you can beat the heat by investing in a solid beverage cooler. You will find here a guide to how to pick a cooler and some of our top picks. Before you search for the right beverage cooler, identify in your head the placement of the cooler. Are you buying it for your outdoor kitchen or are you in need of an easily portable freestanding unit. If the cooler needs to be fitted to a designated outdoor place make sure you have the accurate dimensions, the depth, width and height of the place to fit it properly. Most modern coolers are made of plastic; hence they are lighter in weight. However, you will have to consider the interior and exterior volume of the cooler especially when you are to place it outdoors. The capacity of the cooler totally depends on your usage. Are you planning to buy one that accommodates large gatherings or is it for small weekend parties? Usually, the bottle capacity ranges anywhere from 6-150 bottles in one unit. The Yeti Roadie is undoubtedly one of the most loved beverages cooler. It is small, compact, easy-to-grip and constructed with an aerodynamic body. It has an empty weight of 16 pounds and dimensions 18.5 in length, 13.7 in width and 14.4 in height. It holds a capacity of up to 14 cans and 20 pounds of ice. With its Permafrost insulation and extra thick FatWall, the ice retention is great. Its considered superb for outdoors due to its Rotomolded construction, that allows the body to remain sturdy and durable. This cooler rally is perfect for rugged outdoor use. Made up of polyethene exterior and interior of ultratherm insulated body and lid, the Igloo Glide maintains the ice for 5 days. It is light in weight but big in size, therefore, the sports rally wheels make it portable in use. To lessen the lifting load, it contains slide-lock telescoping and easy-to-grip retracting handles. Coleman is another wheeler cooler for portable use and perfect for outdoor parties, camping and picnics. Its huge in terms of capacity and can hold up to 84 cans. The insulated lid and walls can give ice retention for up to 5 days at90 degrees Fahrenheit. This wheeled cooler is a reliable choice if your outdoors is unpredictable terrains. You can move the cooler with heavy-duty wheels and telescopic handles with lesser stress on your hands and body. Leak-resistant drain system to easily empty the cooler. This red box is another great optionat a great price. It holds up to 70 cans or 50 bottles and has a capacity of 80-quart. It consists of 4 wheels and 2 stable locks. Unlike other cooler rallies, this one is sturdy and big. Pretty much like a barbeque rack. 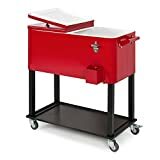 This rolling cooler also comes in with a built-in bottle opener, side handles, a catch tray and an extra bottom tray to store bottles and cans. With all the right choices, Best Choice Rolling Cooler is a good investment for outdoor parties and camps. Dual lids of the cooler make it easier to find the right bottle or can. The wheels are not very solid and sturdy for terrains. Grizzly is a simple design rotomolded cooler with environment-friendly insulation. If you are looking for a cooler that you can place in your backyard or garden, and don’t require to be regularly moved, this is a good choice. It comes with moulded rope handles and a 2-inch large drain plug. As the name says, Grizzly is tough and most resistant. Tested through bears scratch, Grizzly is bear-proof tested so put it in any condition and it will remain sealed. With no wheels, it isn’t a happy choice for frequent travellers, hikers and campers. There are many great coolers available. Be sure to check these out and find the best fit for your needs. And just in case, you are unable to decide, maybe you need a cool beverage to start off your search. Happy chilling!